Carol Swarbrick - Call on Dolly! Prior to doing Dolly, Carol Swarbrick thought the Jerry Herman role she preferred was Mame. Now that THIS Carol has done Dolly, she just loves Dolly Gallaher Levi! According to Swarbrick, Dolly is so brave, she is so smart, she is so loving. Swarbrick says she was embraced by Dolly Levi and she embraced her back. Dolly has a great knowledge of how the world works at that time. Women definitely didn’t have the place in society they have now. She has a memory of life experiences which propel her. With Ephraim, she had a life that she no longer has. They had a lifestyle together that now, as a widow, she cannot replicate. She hopes to have the opportunity to revisit Dolly. She would continue to explore her need to make a living. 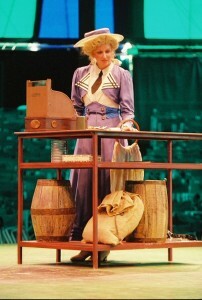 Swarbrick has played Dolly on three different occasions. The first time she did Dolly, she was living in Los Angeles. 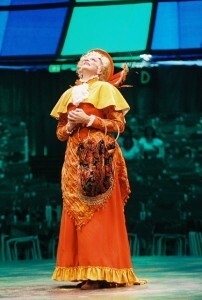 There was a theater company in La Mirada that was doing Dolly and she simply auditioned for it. Like Dolly Levi, she needed a job. She thought that this would be a fun role to approach. Because of a number of things, the “powers that be” at the theater knew Swarbrick. 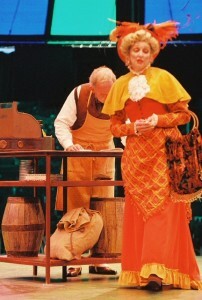 She was at the time the Western Regional Vice President of Actor’s Equity. It was an unpaid position but she was seated on a lot of contract negotiating committees so she knew most of the producers around. She had been living in Los Angeles for a long time. She also knew many of the directors but did not know this director, Dennis Courtney. She got the part and on that first night, she was absolutely terrified. 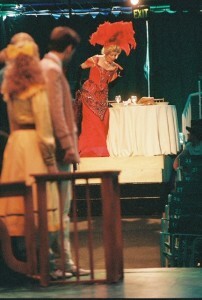 At the end of the show when she came downstage of the orchestra on the passerelle, it was a victory lap. She wanted to do Dolly justice, and the songs and the speeches. She also wanted to do Ephraim justice. Her director was Dennis Courtney. The first time Swarbrick heard Before The Parade Passes By, she knew it was a challenge but she was excited. 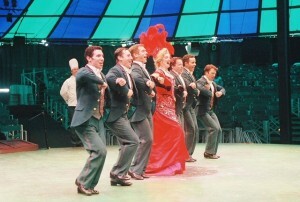 In that production, she also got to sing one of Merman’s songs that was originally cut. That was Love, Look in my Window. Mrs. Rose came in and they were on the stage proper. They have their exchange about memories and how long it has been since Dolly was last there and how long since they’ve last seen each other. 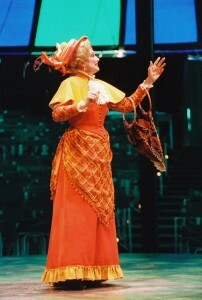 Upon Mrs. Rose’s exit, Dolly walks out onto the passarelle and hits her spot. She does a portion of the speech to Ephraim and then sings Love, Look in my Window. 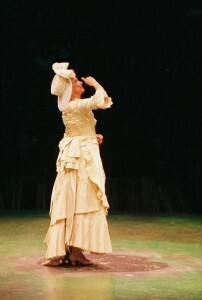 She continues her soliloquy to Ephraim and goes into Parade. 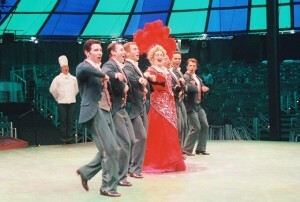 On a scale of comparison with other productions throughout her career, Dolly comes up very favorably. “It’s just so much fun to get into this character.” Dolly is so caring and so compassionate and at the same time, she is so calculating and so manipulative but it is always done with good humor. She is truly wishing the best outcome for everybody. 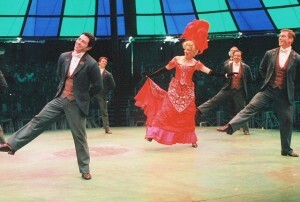 When asked if she thinks Hello, Dolly! 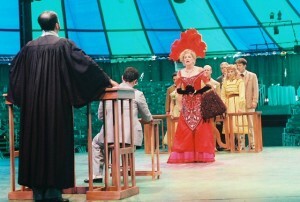 is one of the five best musicals ever written, she says she has to think about that in order to be fair. For women, she says there is no question. Thinking in that vein, she says Dolly very possibly may be one of the top five best musicals ever written. She does think that Jerry Herman is a genius. 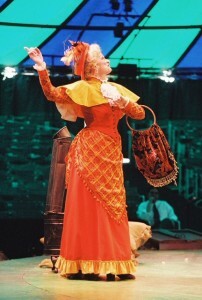 I asked Swarbrick how she approached the eating scene and immediately she is transported to her third production which was at the Sacramento Music Circus in the round. She was up an aisle doing the eating scene. She nearly choked. The stage manager had his binoculars out to make sure she was still breathing. What they had given her to eat were not dissolving. They used tissue paper that was treated somehow and was supposed to stick in the back of her throat. She actually began to choke on stage. Being in the round, there was nowhere to hide. Eventually, her napkin went up to her mouth and she had to expel it! Swarbrick feels she brought a very real Ephraim to the production. The first time she did it, her Horace was Jack Ritchell. He had played Horace Vandergelder with Martha Raye, Karen Morrow, and a lot of ladies. No matter how many times she did the “Ephraim, let me go” speech, she choked up everytime she said, “and I want you to give me away.” The reason she brings up Jack Ritchell’s name is that he commented on how real she made Ephraim. She had a different approach to that speech. Swarbrick says she DOES continue to tweak a performance after it opens. She gets to know the character she is playing better and better as the run continues. 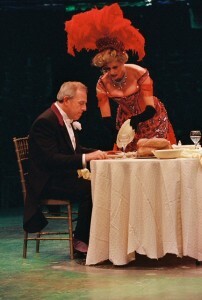 The second production holds a special place for Swarbrick. Life was imitating art. At that time, she was just starting to court her husband. 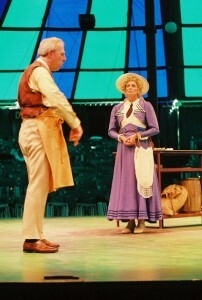 This production was at the Sacramento Music Circus, outside in a tent in the round. The one thing that Carol adopted from Dolly that she has carried forward throughout her career since then is the homework on a character. When her director suggested to her Dolly’s background about her business cards, it was an epiphany. That’s how far the director had gone into the production for Swarbrick. Since Ephraim has died, Dolly has had to downsize a lot. In order to make a living, she relies on these business cards. She’s had to sell off some of her furniture just to live. The morning of this day, she has sold off her last item. She HAS to get money. In Swarbrick’s mind, she thought of what had been sold off that morning. It was one of those gold cups that she and Ephraim had won from dancing. She is not desperate but she is certainly motivated. It made Swarbrick realize that when she approaches a character, she needs to find out what she is doing that we don’t see that makes it possible for us to see what we see. The third time that Swarbrick did the show was at the Woodminster Ampitheater in Oakland, California. The weather conditions were not the greatest. It wasn’t, however, tragic. 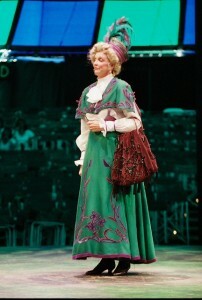 Swarbrick says that when she saw Channing do it, there was no question that she was Dolly Levi. 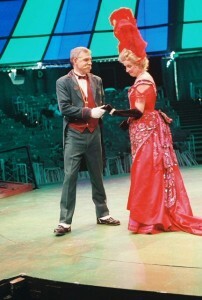 Swarbrick admits that she did not understand Channing’s stardom until she saw her on stage. Swarbrick also saw Merman take on Dolly. She says that woman OWNED the stage, back stage, the lobby, the orchestra, AND the balcony. When she thinks of Jerry Herman, Swarbrick grins. There is so much life and goodness and optimism in his music and lyrics. Swarbrick loves the melodies. The biggest change that Swarbrick has seen in this business since starting is corporations. There aren’t any David Merricks left…at least not on Broadway. It’s now Sony or Disney or Ford. This art form is not nourished by corporations and bean counters. And yet, around the country, there are some wonderful producers. There are compassionate and loving and artistic “Mr. Merricks.” It is sad to Swarbrick that one has to seek out the art now. 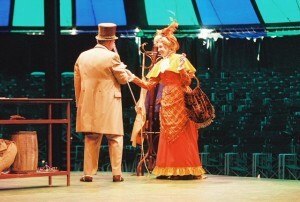 Why does Swarbrick feel that the Hello, Dolly! number stops the show? Well, for one thing, the song is so well known. It is one that everyone has heard and/or sang. It disproves the notion that one cannot go home again. Dolly’s home! It’s recapturing that magical moment that everyone wants in life. She see’s these waiters once again that she loved so much and they LOVE her. The maitre’d could not set the scene better with his constant running around and “Dolly’s coming home! Dolly’s coming back!” And then she’s there and it’s a magical moment. They are doing something very wrong if this does not succeed. Swarbrick’s Horace Vandergelders have all been wonderful. She considers herself very fortunate. Other than just being nervous, she would go out each night and just “show off”. Carol’s closing night was met with hope because she never felt it was her closing night. She is hopeful that there will at least be a fourth production in her future and ours as well!